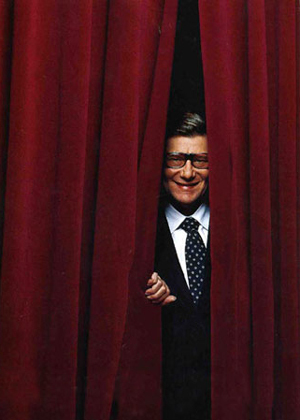 When Christie's announced the sale of the collection of Yves Saint Laurent and Pierre Bergé, I knew immediately that the sale catalogue was an essential addition to my library. Tiding me over while collecting my pennies for the $290 boxed set is the latest issue of Christie's magazine which is dedicated entirely to the sale. It includes such fascinating essays as "Marie-Laure de Noailles, Inspiration and Muse of the Collection" and "Yves Saint Laurent, Hunter of Spells" as well as copious images of objects in the sale in situ. Isn't this the most marvelous bar? It is one of two wildly inventive and staggeringly beautiful commissions YSL and PB made from Francois-Xavier and Claude Lalanne. The "YSL" bar was completed in 1965 made of maillechort, steel and glass. The hammered brass egg is fitted with a counterweight system that causes the top to open and show the bottles stored within and the smaller glass sphere inset into the top is a container for ice. a set of fifteen mirrors with gilt bronze and galvanized copper surrounds which paneled the salon de musique, created between 1974-85. Maybe it's because I live in New York City where space is at a premium, but YSL and PB's Kunstkammer seemed to me to be one of the most luxurious spaces of all. This gallery-like room follows the tradition of 16th and 17th century princes who dedicated a room to their most treasured virtuoso works of art. Here, cameos, rock crystal and ivory objets pay tribute to the discerning eye of one of the most important design talents of the 20th century.